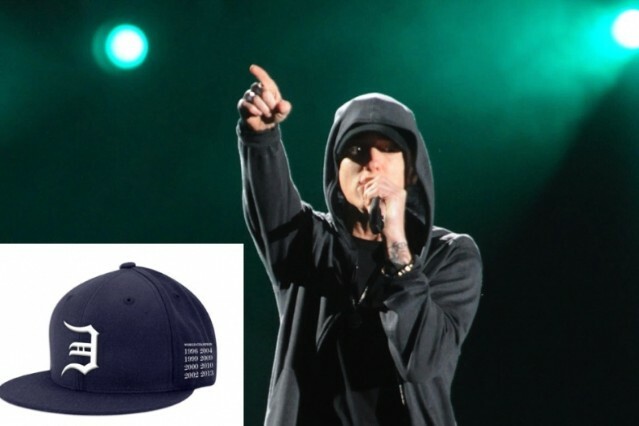 Lady Gaga announced the name of her upcoming album ARTPOP via tattoo, and now Eminem has dropped a monster hint that his 2013 plans include a new album on a commemorative baseball cap sold on the rapper’s website. In a hat tip to his home team the Detroit Tigers, who lost the World Series to the San Francisco Giants last night, Em has started selling the “Eminem Baseball Tribute Champ Hat,” which features a side panel “dedicated to the landmark Eminem solo albums.” The cap’s side reads off all the years that Eminem has put out an LP — 1996 (Infinite), 1999 (The Slim Shady LP), 2000 (The Marshall Mathers LP), 2002 (The Eminem Show), 2004 (Encore), 2009 (Relapse), 2010 (Recovery) — followed by 2013. Specifics on the upcoming album, like title and release date, have not yet been released (or confirmed by anything other than this hat). The caps run $30 and a portion of the proceeds will go to the Marshall Mathers Foundation, which helps disadvantaged youths in Mathers’ home state of Michigan. Next year’s studio album will be Eminem’s eighth and the follow-up to Recovery, which couldn’t have had a more appropriate title. Recovery was 2010’s best-selling album (almost 3.5 million units sold that year), and it also became the first album to sell one million digital copies in the U.S. The record also won the 2011 Grammy for Best Rap Album and ranked on SPIN’s Best Albums of 2010 list. The rapper’s sixth full-length, Relapse, won the 2010 Grammy for Best Rap Album but didn’t fare quite as well critically or commercially, with a little over 1.7 million copies sold in 2009. Mathers said earlier this year that he was “really focused” on music, but was too caught up working on Welcome To: Our House, the newest release from rap supergroup Slaughterhouse, to delve into his own material. But that hasn’t stopped other artists from finding inspiration in the Detroit MC’s catalog. An older Eminem track, “Cleanin’ Out My Closet,” off of 2002’s The Eminem Show, was recently sampled by New York rapper Angel Haze for her track “Cleaning Out My Closet,” which explicitly recounts sexual abuse. Em also popped up on Pink’s “Here Comes the Weekend” and became a very popular guy on Facebook.